Our Under The Sea Critters - Petite Baby Shower or Birthday Party Table Runner will bring your party theme to an all-time favorite. You can take your party decorations to the next level with your petite table runner and will give your tablescape a big pop of color and pattern. You can also add one to your gift table or candy buffet to bring the entire party to life. Our party petite table runners are professionally printed on a water-resistant paper that has a glossy finish. Under The Sea Critters paper table runner is a perfect baby shower or birthday party decoration for gift tables, candy buffets or dining tables. SIZE: Under The Sea Critters baby shower or birthday party petite table runner measures 1 foot by 5 feet. EASY PARTY DECORATIONS: A Under The Sea Critters Party Table Runner is an easy way to decorate for your baby shower or birthday party and bring the sea critters party theme to life. Easily dress up any food or gift table with this cute paper table runner. 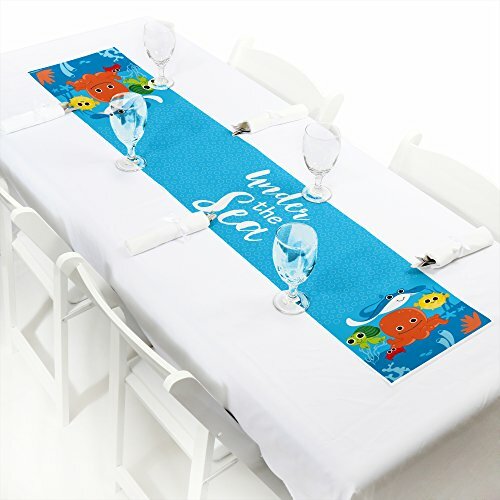 PREMIUM PARTY SUPPLIES: Under The Sea Critters petite table runner is professionally printed on premium-grade satin paper with a photo-like shine. Each paper table runner is individually inspected then carefully packaged by hand and rolled into a protective sleeve. Paper table runners are water-resistant and will make your party clean up a breeze! MADE IN THE USA: Under The Sea Critters - Petite Baby Shower or Birthday Party Paper Table Runner is designed and manufactured at our Wisconsin facility using materials that are Made in the USA.